Dr. Frasier Crane was in the middle of hosting yet another one of his boring and superior radio shows when he got a call from a man named Muhammad. Muhammad's psychological problem was simple: He'd soundly beaten the crap out of everyone. That is, everyone standing in his way to becoming the greatest heavyweight boxing champion of all-time. But he went on and on, complaining that he was running out of worthy opponents. Frasier, due to his longtime avoidance of sports, didn't know who this Muhammad Ali person was, why he kept calling him on an almost daily basis, or what he was actually trying to say or imply as he spoke in very simplistic rhymes. Frasier was pretty sure he was being pranked, and told "Muhammad" that he was going to hang up on him. "You, sir, are a raving lunatic," Frasier added. This only enraged the angry caller, who then fired off a masterful impromptu self-praising witty limerick in a sing-song voice, and the next thing Frasier knows he's being challenged to a fight. Ordinarily Frasier Crane, learned man of the world and the host of one of the nation's most reputable self-help radio shows, would, of course, turn down such an insane and barbaric suggestion from a stranger. But having felt huffy and aggrieved at being shown up by this caller's cheeky spontaneous wordplay, Frasier decided to don the gloves and engage in fistacuffs. Nobody told Frasier what he had just done. Everyone at the station was horrified, and the station's president, an ex-congressman named Joey No-Thumbs, phoned Frasier's father, Martin, in hope that he could talk both combatants down. Frasier finished his show by, as he had always done, calmly talking dehydrated - hence depressed - attention-disorder cases off of ledges and bear enclosures, and unsuccessfully trying to stop a ten-year old girl from crying by, after listening to the rising sobs of this hysteric for twelve minutes, and realizing that the kid wasn't listening to a word of advice he was giving her, finally told her that "Yes, yes, Virginia, all men are like that. Get used to it, Babe - short for Babe in the Woods! Good day to you. Next caller please". Soon, everyone was saved, and Fraiser ended his show on an ironic up-note by wishing everyone else in Seattle a good day too! "Fraiser," his cute assistant Roz loudly said when he stepped out of the broadcasting booth, "Don King just called and he wants to represent you! The fight is on!!" "What fight?" enquired the arrogant intellectual radio psychiatrist, who, due to way too much drinking with fewer time passing in-between visits to the bottle, kept dipping into his dwindling reserve of memory loss. After running thru a confused but excited contingent of reporters and TV cameras that had gathered outside the radio studio, yelling "No comment" at questions that made no sense to him, it soon dawned on Frasier that he was stepping into the ring with a boxing legend with the suspicious name of Muhammad Ali. By the time he realized that this Ali character was a real fighter, and not just a caller pulling off some kind of radio prank, it was far too late to back down. The whole of Seattle was imploring him to fight! All Seattle's newspapers and sports talk radio shows urged Frasier to accept Ali's challenge, and people kept buying him drinks on his nightly excursion to his favorite bar. To a man they were urging him to fight just for a laugh. They all knew that Ali would batter the professional psychiatrist's face into putty and pulp, which they wanted to see, and would pay to witness. But what the roaring public never comprehended, nor did any reporter consider - and it never crossed the brilliant mind of Muhammad Ali himself - that Frasier's incredible ability to understand the human psyche would be a factor in the fight. So along with his brother Niles, and his ex-policeman father, Martin, Frasier put together a foolproof strategy designed to repel all of Ali's fierce hooks, lefts, straights, whomp-em-sideways, over the tops, tickle-him-sillies, and jabs, and to render him defenseless. Meanwhile, over in Ali's camp, the trash talking was well underway. A little digging into Frasier's history had resulted in the juicy revelation that Frasier used to frequent a bar in Boston nearly every night of the week as well, and that had gone on for over a decade. Because Frasier had been respectfully calling Ali what he thought was his nickname, "The Brown Bomber", Ali thought that he was being mocked and became madder and madder each time he heard it. Muhammad Ali then took great pleasure in nicknaming his gay opponent "The Boston Boozehound" - and making it stick! Everyone knew that The Boston Boozehound would soon be on his way to a beating he wouldn't dare wake up from. The 9th of January 1999, a date imprinted on the minds of everyone in attendance at Caesar's Palace in beautiful Las Vegas. It is also well remembered by all who've watched the fight on closed circuit television, Youtube, or on Wide World of Sports' opening reel of its "Agony of Defeat" segment. The betting was strong in Vegas that night, as strong as the perfume on an expensive call-girls' neck, and the atmosphere in the hall was tenser than last call on the Titanic or at a Turkish Bar. Ali was wheeled out of his dressing room looking like death warmed over, but told the young intern paid to pick at his scabs that he was as determined as always to defend his crown. Frasier walked out of his own dressing room with the aid of two security guards and a kid with an ice cream cone, looking like he'd just sampled a particularly bad Beaujolais. When he climbed into the ring Frasier misjudged the tension of the ropes, and threw himself into the crowd. The two boxers finally inched their way to their corners and sat down. Ali teetered on his stool, shaking from head to toe from his illness and trying his best to keep his left leg from folding under his right knee, which was itself whipsawing around like a cat quartering a mouse. Fraiser's dad told him to just punch Ali, for God's sake. "Just draw some blood and finish it." His brother, Niles, who'd just gotten Frasier stupid drunk on some of the finest old stock blends money can buy, told Frasier to "Just remember Dad's strategy, and for God's sake don't splash me with anyone's blood". In his corner Ali prepared to knock the head off the famous shrink and piss down his neckhole. As the bell rang Frasier stood up and faced Ali. From the get-go Frasier ducked and bobbed in a drunken attempt to evade Ali's hands, which seemed to be shaking and glued to Ali's thighs as he slowly staggered around the ring trying to keep his balance. Frasier knew it was Ali's famous rope-a-dope! He was not going to fall for that old canard, no sir! Not Frasier Crane! Above the noise of the baying crowd Frasier suddenly remembered to yell to Ali, "Sir, Remember your favorite childhood toy". Ali, by this time a scarcely animated pugilistic puppet leaning against the ropes with its head turned towards the refreshment stand, was trying to deliver a sharp jab to Frasier's midsection. He succeeded in almost moving his hands when he heard the command to remember his favorite childhood toy. And Fraiser, drunk as a Mormon maiden on her crazy religion brand of wedding night and lit up on so many Red Bulls that he was peeing purple, saw two of everything there was one of and soon fell backwards against the ropes himself. Somehow, by the grace of the goddess of drunks everywhere, he managed to stay on his feet by standing on Ali's. Ali leaned on his ropes and was motionless. As usual. He barely perceived his opponent standing on his feet, which he could hardly feel on a good day. He was also unaware that Frasier's alcohol and caffeine poisoned liver was standing motionless right in front of his useless right hand for all the world to see (and photograph, see "List of Pulitzer Prize winning sports photographs"). One look into Ali's eyes would show that he had been caught up in a pleasant memory of his favorite childhood toy, an old teddy bear he had named Raggsy. An innocent smile attempted a pillar-like creep up and slowly over Ali's trembling mouth. The Champ's arms relaxed a little, but still stayed glued to his sides. His urge to hurt Frasier, to punish Frasier, faded slowly away as, in his memories, he was running up the gravel lane throwing a cowbone way over to the side of Raggsy, who, tail wagging, ran happily after the treat. Frasier started to get some level of awareness and, sensing that his victory punch had landed, staggered up the ropes a little until he was even with Ali's right ear, and strongly suggested that he fall down onto the canvas. Ali didn't hear him as, enraptured in the brain-fart world of memories where Raggsy was not killed by his father in an almost-successful attempt at practicing man/dog autoeroticism but lived to a ripe old age of 14, he glided nonchalantly into the phase of life called "vegetable". But Frasier, thinking that Cassius Clay - as he had taken to calling this buffoon in his mind - was dissing him, and at the loud and enthusiastic urging of the crowd, punched Ali in the face. Ali fell like a sack of bricks and lay twitching on the floor as the ref counted to 10 and held up Frasier's arm, declaring him the winner! At which point Frasier felt his inner-man emerge for the first time in his life and kicked Ali in the ribs. He kicked him just once, so Clay would remember the day that The Brown Bomber dared to challenge Frasier Crane to put up his dukes. Frasier always wanted to savor the sublime feeling of making a defenseless old man tumble over with just one punch to the face. "Who's the greatest now, Cassius?" Frasier yelled into Ali's drooling mouth, having read all he needed to know about the man's Parkinson's in Newsweek. "LILITH!! LILITH!! YO LILITH, WE DID IT!!!!!!!!!!!!" Ali lay on the canvas awhile, mildly convulsing somewhat, until he smiled and waved away all help. Or so it looked. 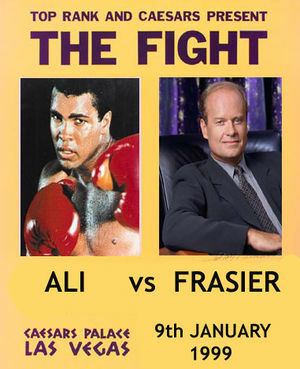 Ali vs Frasier is part of Uncyclopedia's series on Mass Media.